Owning any version, including retail, entitles you to a DRM-free copy on GOG.com; see Witcher Backup. Incompatible with Windows' built-in color calibration feature. Calibrated screens will have ill in-game colors. A comprehensive list of known issues and potential fixes. The Witcher 2 for PC Technical FAQ. SecuROM 8 and SecuROM PA DRM. Removed in patches and later retail releases. Enhanced Edition - Offers various bonus goodies including the complete soundtrack in MP3 and FLAC formats. All versions can be registered on GOG.com even if a product key was not included; see Witcher Backup for details. Install the latest patches to fix bugs and remove DRM. The No Intro Videos Mod skips all intro videos except the logo by CDProjekt. Market Price Mod makes buying and selling prices within markets more fair to the player. It reduces the 24:1 ratio between buy to sell prices and reduces it to 5:1 as seen in the original game. For people having problems with the size of text on large resolutions or on small displays, getting any variation of the Comfy Font, and placing the .dzip in the CookedPC folder will make it bigger and more visible. Full Combat Rebalance is a mod created by the developers of the game. It includes many changes, including an 80% increase in responsiveness per Geralt's animations and decreased time for returning to exploration after combat. The file is 1.5 GB in a compressed format. The Witcher 2 Savegame manager allows for the easy backup, management, and removal of The Witcher 1 and 2 save files. Can tremendously improve the clutter of savegame files. The Witcher 2 Tweaker allows for greater customization of graphics options to further tailor your game for the PC. Also has helpful tips for improving performance on some computers as well. Steam version uses Steam save game data location when cloud is activated. Video and input options can't be changed in-game. The game increases FOV on outdoor areas and further when fighting. To customize, use Change your Fov mod. Force using the Nvidia Control Panel/AMD VISION Engine Control Center. The Witcher 2 makes use of a sharpening filter that increases the sharpness of the game's visuals. While this setting has a negligible performance impact it does cause increased aliasing and adds an unnatural sheen to many objects, if those bother you it can be disabled with an INI tweak. Find AllowSSAO=1 and replace it with AllowSSAO=0. Download and open NVIDIA Profile Inspector. Under Profiles select The Witcher 2. Under Ambient Occlusion compatibility insert the compatibility code 0x00000033. Under Ambient Occlusion setting select Quality or High Quality. Under Ambient Occlusion usage select Enabled. On the top right hand corner click on Apply changes. You may now close Nvidia Inspector and enjoy The Witcher 2 with HBAO+ enabled. Cinematic Depth of Field: Of the three depth of field options available, cinematic depth of field results in the biggest performance decrease. Enabling it applies a stylised depth of field effect to cutscenes and dialog sections. It is important to note that enabling it essentially enables depth of field anyway, so this option should be used in conjunction with 'Depth of Field - Cutscenes'. Again, it's performance impact is significant. Light Shafts: This option adds realistic light glares as sunlight filters through trees, etc. However, in graphically busy areas such as forests it can result in a major performance hit, and as such disabling it is recommended on lower end systems. LOD [Level of Detail] Distance: This decides how far away detailed objects (such as some shrubbery, objects, etc.) are rendered. The higher you set this value, the further away such objects will be rendered, and the larger the impact on FPS. As the difference between the 'Near' and 'Far' options is visually negligible in almost all instances, 'Near' is recommended for most systems. For systems which only just meet the system requirements, consider using the 'Minimal' option. Motion Blur: Enabling this option will result in a stylistic blur effect rotating the camera, which also results in an overall performance decrease. SSAO [Screen Space Ambient Occlusion]: This option improves the overall quality of shadows in-game by increasing their definition and contrast. Enabling it will also largely impact performance. UberSampling: This option essentially requires your system render everything on-screen multiple times before displaying, resulting in a drastic increase in overall visual detail, maximising object detail and smoothness, with the expense of a huge performance hit. It is only recommended to enable this option if you have a very high-end system. Wet Surfaces Rain Effect: This option is only active when it is raining in-game, and adds a semi-transparent filter to many objects to make the rainfall impact appear more realistic. It can result in a sizeable performance hit during rain sequences, however, so disabling it is a good idea for performance increases. Note all other graphics options can be enabled/disabled with little or no FPS impact. Note that whilst 'Texture Downscaling' has a significant visual impact on the 'High' setting, reducing downscaling to 'Low' or disabling it entirely can drastically improve the look of the game with very little performance impact. Game can be started and played with a controller, but launcher can not be fully navigated without mouse/keyboard (Enhanced Edition). Most bindings can be remapped (Enhanced Edition). For DualShock use the PS4 Interface Icons Mod. TweakGuides has created a comprehensive guide for fixing issues in this game. Incorrect texture settings. Launch the game and navigate to the 'Options' menu on the launcher. Locate the option for 'Texture Memory Size (MB)'. This is how much of your graphics card RAM is allocated to texture storage. For a 512 MB card, it is recommended set this to 'Small', whereas for a 1 GB card set this to 'Large'. Allocating insufficient memory for texture storage can result in delayed texture rendering and constant stuttering during gameplay. Rendering too many frames in advance. To fix this use your GPU configuration panel to manually set the value of "Maximum Pre-Rendered Frames" (Nvidia) or "Flip Queue" (ATI) to 1. You may also need to limit frame rate and/or enable Vsync. The game attempts to reinstall the Microsoft .NET Framework 4.0 every time the game is launched. Save as a .reg file, and then double click on it. If you have software from LucidLogix installed (It may have come with your motherboard), remove it. Patch 2.1 is meant to fix communication between the game and the Witcher forums arena leader boards. Since the update, many people have experienced an error that says The application failed to initialize properly (0xc0000142). There are a few ways to fix this. A special cut-scene should be played off, but instead you receive a black screen and only hear Dandelion's voice. Possible Fix: Change your screen format to 16:9 ratio. It's working for most people. The game will crash to desktop without any error messages. You may encounter this right before, after or during cut-scenes (i.e. when the game is auto-saving). The solution modifies the Windows Registry in order to allow Windows to allocate more memory to other programs. More information here. If the problem persists, either deactivate the real-time protection of your antivirus program or add exceptions for The Witcher 2 folders and executables to it. Crashes on saving or auto-saving: this will occur in 32bit systems due to low memory. To solve it, press windows key + R key to bring up the Run window. Write "bcdedit /set increaseUserVa 3072" without the " and press ↵ Enter. Reboot the PC. In order to undo this change you can bring the Run window up again and write: "bcdedit /set IncreaseUserVa 2048" without the " and press ↵ Enter. Reboot the PC. Crashes on loading save games: this will occur in some systems if you accumulate too many MBs worth of savegames. To solve it, go to your save game data folder and either delete or move most of the stored saves. You can test this with constantly opening and closing the chest. About 10 times should make the game crash. If you have AMD Gaming Evolved installed, make sure the program is not running while playing. Large number of saves will result in longer loading times when you open the menu for loading a save. To fix delete unused saves or move them to a backup location. There were errors compiling scripts. Unable to run game. Maybe some selected user packages are incompatible? Unzip the file and replace "The Witcher 2\CookedPC\base_scripts.dzip"
When using ambient occlusion forced through Nvidia Inspector, there is a noticeable flicker while moving around, this is caused by higher-detail meshes being loaded in. To fix this issue, in the user.ini under the "rendering" section, increase "MeshDistanceScale" to a much higher value; eg: "MeshDistanceScale=100". This will also reduce non-AO related pop-in and in general make distant objects look better. Note that this potentially has a performance impact, test different values to see what works best on your system. 2.1, 3.3 OS X and Linux only. Scaleform GFx Scaleform is also used for video playback. The Linux port is not native, and is packaged in a Wine-like compatibility layer called eON. eON is used for some other titles (such as Stronghold 3). It is not based on Wine, but has a similar reimplementation of the relevant Windows APIs. MESA based drivers are not currently supported. Intel integrated graphics are not currently supported. 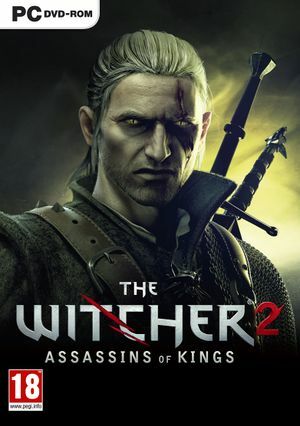 ↑ News - Now Available on SteamOS - The Witcher 2: Assassins of Kings Enhanced Edition, 80% off! This page was last edited on 14 April 2019, at 10:32.